6 months ago, our team started to run systematic iteration retrospectives. Within these 6 months, our team became more agile than ever. Running efficient retrospectives is what makes good teams great, it is what truly makes a team agile. Here is our story. One his own, everyone writes what went well on green post-its, and what did not went so well on blue post-its. Everybody sticks them up on the flipchart. The animator reads every post-it aloud, asking team members for details, and tries to group notes together. When everyone is ok with the groups, dot vote : every team member gets 3 points, that he can assign as he wishes on any group. Here is what the board should look like at this point. Pick up the 3 most voted issues, give everyone 5 minutes to think of useful actions to fix these. Then take another 5 minutes so that people can discuss their solutions in pairs, and another 5 minutes to do the same in groups of 4. Eventually, as the animator reports on the flipchart, do the same altogether. Make sure that the solutions are doable within the next sprint, if not discuss and split them until they are. Again, dot vote for the prefered actions. 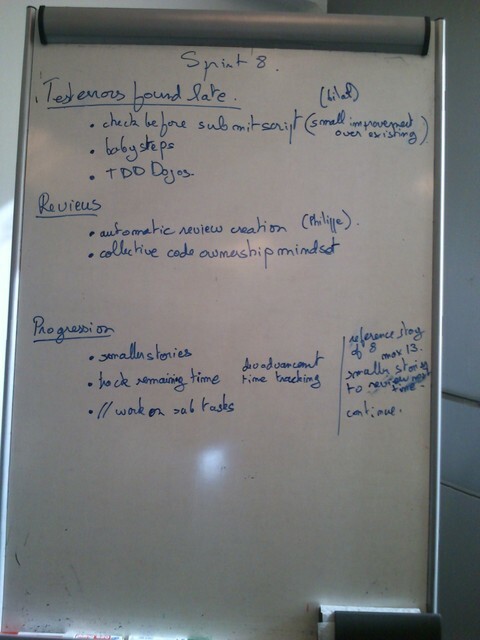 As soon as the retrospective is finished, the animator must enter the actions in the coming sprint backlog. These actions are not user stories, but they must be done. If there are not, the team cannot be agile as they will be no continuous improvement. Don’t assign any story points to these items, but let the velocity auto adjust for a given amount of improvements during every sprint. 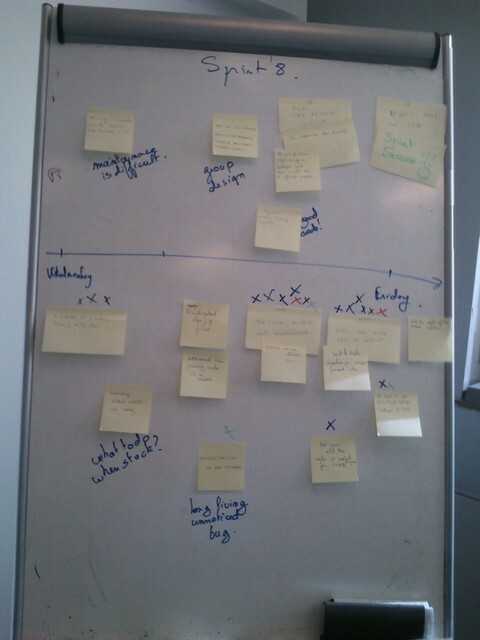 After the first one, every team member animated such a retrospective, one after the other. When everyone was at ease with this, we changed the format. We bought Agile Retrospectives: Making Good Teams Great and everyone was responsible for designing his own retrospective session when his turn came. This allows different and various insights. If you haven’t yet, you have no excuses not to start now !